Synopsis: We all have a superhero inside us, it just takes a bit of magic to bring it out. In Billy Batson’s case, by shouting out one word – SHAZAM! – this streetwise 14-year-old foster kid can turn into the adult superhero Shazam. Review: Those poor souls over at Warner Brothers/DC Comics were likely looking at 2019 and feeling crestfallen at their prospects. With three highly anticipated Marvel films set for release and their Wonder Woman sequel pushed back to 2020, it must have felt like any hopes of getting another foothold in their franchise ladder weren’t going to happen. I’m not sure how much faith they had in Shazam! at the outset but they should have pumped this one up a bit more than they did. Sure, I saw the preview more times than I needed to before other films but going into the movie I wasn’t expecting anything vastly different than the soulless offerings they’ve been churning out in the past decade. Thankfully, it seems like they may have stumbled onto something good. Foster kid Billy Baston (Asher Angel) has found himself on the wrong side of the law for the last time when he is apprehended after obtaining information from a police database. He’d been attempting to find his mother after they were separated when he was a toddler and hasn’t given up hope that she’s out there and is looking for him as well. Taken in by another foster family that already boasts a diverse line-up of kids in similar family situations, Billy bides his time until he can run away again to continue his search. 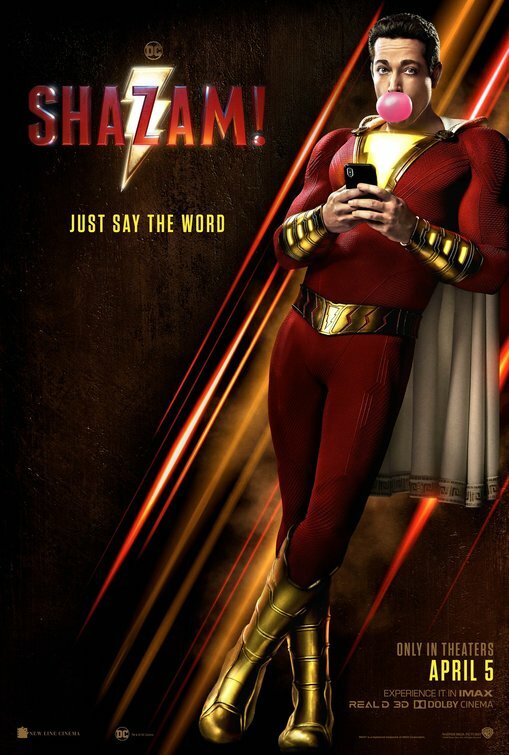 When he’s mysteriously brought to the temple of an aging Wizard (Djimon Hounsou, Serenity) tasked with guarding the seven deadly sins, he absorbs the fading Wizard’s magic and turns into a buff superhero (Zachary Levi, Thor: The Dark World) anytime he says the Wizard’s name: Shazam. Unware of the extent of his newfound powers, Billy has the mind of a teenager in the body of a mature adult and at first doesn’t exactly use his upgrades for good. Though he runs through some trials of his abilities with his foster brother (Jack Dylan Grazer, IT), he starts to be the kind of hero that’s only looking out for himself instead of assisting others. He’s put to the ultimate test when Sivana (Mark Strong, The Imitation Game) enters the picture. Obsessed with finding the temple of the Seven Wizards that he too visited as a young child, the grown man eventually makes his way back to the hidden dwelling and frees the sins from their prison. Now being used as their vessel for evil, Sivana sets his sights on taking the Wizard’s power from Shazam (who has become something of a local Philadelphia celebrity) and eliminating everyone he loves. If there’s one thing that’s been sorely missing from the DC slate of superhero movies it’s a sense of humor and finally the stiff suits at the studio backed up and let wiser talents guide this process – and it’s largely successful. Though the previous credits for screenwriters Henry Gayden (Earth to Echo) and Darren Lemke (Goosebumps) might not have suggested they’d be the right choices to bring Bill Parker and C.C. Beck’s superhero to the big screen, Shazam! is a welcome change of pace from the darker-hued adventure films the studio has been greenlighting. Adding director David F. Sandberg (Lights Out, Annabelle: Creation) was another inspired choice as he’s nicely able to balance the lighter/more comedic elements of the plot with the darker edges supplied by Sivana. Sandberg has cast the film well starting with Levi as our hero that becomes more than the sum of his bulging muscles and caped suit. Seeing that he’s actually a teen given awesome powers, Levi might overplay the sarcasm and wise-cracks a bit early on but it provides him a place to jump off from as he grows into a more responsible hero and a more understanding teenager. He has a nice rapport with Grazer and his other foster siblings, adding some layers to a character that could easily have been pretty one-dimensional. The villain role doesn’t seem to be much of a stretch for Strong at this point and while he’s perfectly fine in the part it would have been nice to see it played by someone a little less expected. It’s just too easy for Strong to slide into these wicked characters by now. While it’s a good 10-15 minutes too long, spending unearned time with Sivana and following Levi through perhaps a few too many blunders, Sandberg and the screenwriters manage to introduce a late breaking twist that I found pretty delightful and nicely inclusive. Buoyed by strong performances by the child actors (a rarity these days) and a nice dose of humor and creativity, Shazam! is a fun right turn from the careening curve DC studios couldn’t pull out of. Get your MN Movie Man Updates! Why Haven't You Seen This Movie? portalultautv on Movie Review ~ Shazam! Copyright © 2015 Joe The MN Movie Man. All Rights Reserved.